Arrival day- notice and advisory to clients ...the line at immigration for non EU citizens at Milan Malpensa airport must have taken at least two hours to get through. The first indication of population overload. After a three hour drive, I arrived to sunny Santa Margherita Ligure. The first stop is a hotel site visit at Imperial Palace- the local five star, sitting up on her perch, emblematic of Old Italy. They have three beautifully frescoed suites with big views of the town and renovated bathrooms. Immediately added to our list. Corner rooms glass walls and frescos, a hit in my list, and to top it off a descent price point compared to what you now see on the Amalfi coast or Venice. As a specialist in luxury travel to Italy, the objective of this particular trip was to find hotels with sea and beach club access. In Italy, there is some public beach space, but the scene is a the beach clubs. You pay anywhere from 15 Euro and up to rent a chair, and clubs are equipped with food and beverage service, shower facilities, sometimes even a salt water swimming pool. I had to make it to the city center before stores closed, full well knowing that on this leg of the trip no other opportunity would arrive to satisfy my shopping gene. Santa Margherita Ligure was already sophisticated and now even more so. Great shops, boutiques, and interesting corners to explore. With a major renovation in process, the Grand hotel Miramare is a lovely 4 star which will undoubtedly become a 5 star one day. I enjoyed the sea view room, newly renovated bathroom, and an extremely accommodating staff. They also have a large pool, sea access, and a big bonus: parking. The hotel has an excellent position over looking the harbor, and is within walking distance to shops and restaurants, although the dinner in the hotel was actually very good, freshly caught fish. On the bed and breakfast level, there is Loanda Tre Merli, an excellent choice for the young and up and coming. The only downside is the location in the port area, which could cause some noise issues when boats come and go, but the rooms are sweet and the bathrooms brand new. I squeezed in one more five star, Hotel Excelsior, which is wedged between Santa Margherita and Rapallo, an excellent locations deed. The décor is a little too traditional for my taste, but it has two shoreline pools, valet parking , and marble bathrooms. It is perfect for a professional convention, but not my client base. The rest of the afternoon spend with Giorgio a 91 year old friend who lives over looks by the golf of Tigullo, private luxury all on its own. 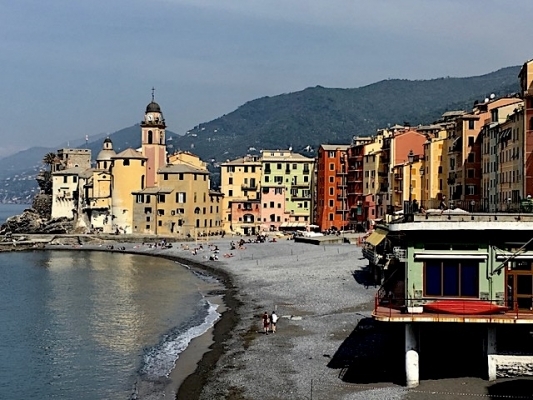 Liguria remains a top travel destination in Italy, and with good reason. I did encounter massive crowds from the cruise ships docking at Cinque Terre, but the crowds disperse in the evening. Perhaps the best approach is to stay elsewhere in Liguria and visit Cinque Terre as a day trip. The research continued down the coastline of Liguria, through Tuscany and into Lazio, all the while looking for premiere seaside hotels to share with all of you. In the course of one week, I visited 23 hotels and 7 villas, continuing the ongoing quest to bring you the latest in luxury travel to Italy.